Vauxhall's new ADAM is a sleek, small hatchback designed to rival the growing number of upmarket superminies already in the market, such as the Fiat 500, Audi A1 and Citroen DS3. Instead of going the fashionable retro route popularised by Fiat and MINI, the new Vauxhall Adam has adopted a fresh, modern look similar to the impressive Audi A1 supermini. The Vauxhall ADAM certainly is eye-catching. Its modern design features Vauxhall’s latest front-end design language with a prominent 'Griffin' badge and unmissable LED running lights. While attractive, the Vauxhall's design is perhaps not as impressive as that of the Fiat or Mini. Blade creases along doors, however, give the ADAM a recognisable edge and bold stance similar to the beautiful three-door Astra GTC coupe. It is not just the funky, bold stance that makes the ADAM an appealing car. The ADAM also offers a huge scope for customasiations, including options to paint the roof a different colour to the rest of the car. This means it entirely possible that you’ll never see two identical Vauxhall ADAM models on the road. The Vauxhall Adam has the look and style to compete with the A1 and MINI, but it lacks the driving sparkle of the two rivals. It grips the road well, but you get very minimal feedback from the front wheels through the steering. The ride quality is also rough compared to rival superminis. Part of the reason the Adam falls short in drive quality is because it features a range of dated engines that lack the kind of power and torque seen in rival superminis. We expect Vauxhall will bring the Adam driving experience up to date in forthcoming Adam upgrades. 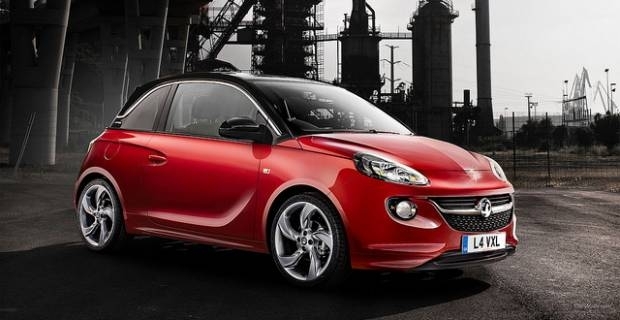 Again, the Vauxhall Adam doesn't quite match its rivals in when it comes to running costs. Vauxhall only offers tax-exempt sub-118g/km models in their line-up, while Audi, MINI and Citroen all offer tax-exempt sub-100g/km models in their line-ups. The Adam engine range is also made up of a single 1.2-litre petrol and two 1.4-litre petrols, while rival cars all offer similar average fuel economy of around 55mpg. That said, the long-term warranty and a low insurance group on the Vauxhall Adam, keeps other running costs under check and gives drivers something to smile about.